Usage notes: A traffic jam is un embouteillage or un bouchon, but typically that refers to traffic that’s stopped in just one direction due to an accident, road work, etc. 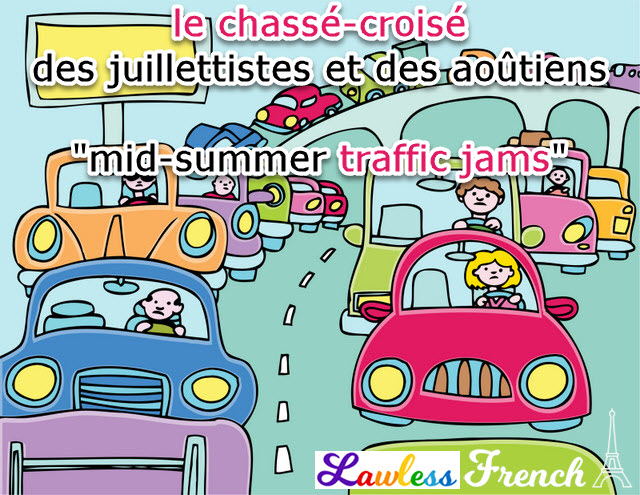 When traffic is disrupted both ways, it’s called le chassé-croisé, and it happens several times a year due to France’s staggered vacation periods. 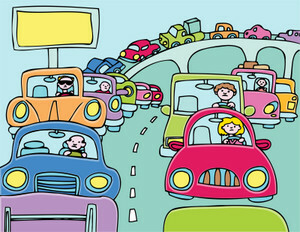 As one zone’s vacation ends and another begins, there are traffic jams in every direction. The worst of these occur in late July and early August. Employees have either July or August off from work, and so are known as either juillettistes (from juillet – “July”) or aoûtiens (from août – "August"). When the juilletistes head home as the aoûtiens start out, le chassé-croisé des juillettistes et des aoûtiens begins. The term chassé-croisé was created from the past participles of chasser (to chase) and croiser (to cross), so literally means "chased-crossed." The original meaning, also found in English, is a dance step where partners take turns crossing in front of each other.